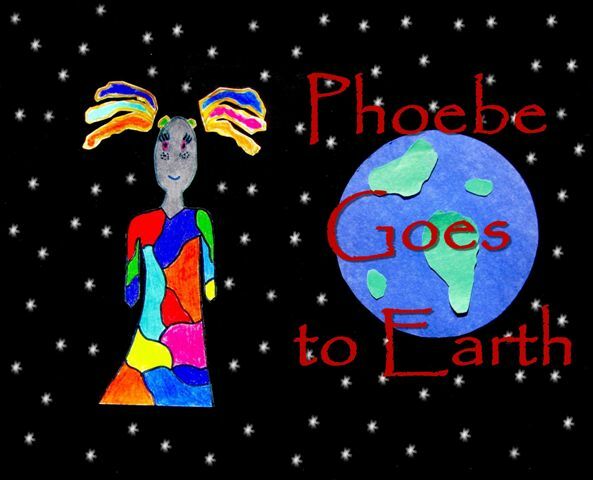 A while ago a writer named Demetrice Jefferson sent me a book she wrote called Phoebe Goes to Earth. That was really nice of her. I like this book because it’s about two things I love: dinosaurs and space. It’s about this alien girl from another planet that gets a space ship for her birthday. Can you believe that– a space ship? I’d love to get a space ship for my birthday, but I’m not sure I’d have room for it in our yard. Space ships are really big and they make a lot of noise when they launch. Me and West went to Florida last week to watch the space shuttle launch and it was awesome. Her name is Phoebe– which is strange because that’s an Earth name. And her planet is named Zion, which is another Earth name. Maybe those are just Earth translations of the names. Maybe we here on Earth wouldn’t understand the names in the alien language. Phoebe doesn’t look exactly human in the pictures, but she is humanoid with rainbow-ish color hair. So Phoebe gets this space ship for her birthday and starts exploring and finds earth. And here’s the neat thing: she finds earth right at the time of the dinosaurs. Can you imagine that? Getting a space ship and then finding dinosaurs? The things that happen in this book couldn’t happen in real life. For one thing, I’m not sure how a little alien girl could drive a space ship by herself. Also, she could not have met a brontosaurus when she got to Earth because the brontosaurus never existed! Maybe an apatosaurus, but not a brontosaurus. But that’s okay. Books about stuff that could never happen in real live are actually my favorite kinds of books. They’re less real so there’s more adventure and fun creatures. rex lived during the cretaceous period. Stegosaurus, apatosaurus and pterodactyls lived during the jurassic period.